European Antibiotic Awareness Day (EAAD) is held annually in November. It is a European-wide annual event that raises awareness on how to use antibiotics in a responsible way that will help keep them effective for the future.2015 also marked the first World Antibiotic Awareness Week, further highlighting that tackling antimicrobial resistance (AMR) requires global action. As part of last year’s EAAD and World Antibiotic Awareness Week, both the public and medical community were asked to become an Antibiotic Guardian by choosing one simple pledge about how they make better use of antibiotics and help save this vital medicine from becoming obsolete. European Antibiotic Awareness Day (EAAD) is held annually on 18 November, during World Antibiotic Awareness Week. These are European and global campaigns that raise awareness on how to use antibiotics responsibly and help protect antibiotic for the future. Without these vital medicines we will not be able to treat simple infections and procedures such as surgery and chemotherapy may be too risky. During this week in November community pharmacy teams can support patients, the public and other health professionals to use antibiotics in the best way possible and keep them working. Here are some easy steps to championing antimicrobial stewardship in your pharmacy. 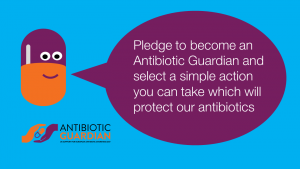 Visit www.antibioticguardian.com and pledge to do one thing to protect antibiotics for the future and get your Antibiotic Guardian certificate. Once you’ve done this simply encourage your colleagues and patients to sign up too! Written in conjunction with the Antimicrobial Pharmacist team at University Hospitals of Leicester NHS Trust, this action pack gives you all the information you need to promote antimicrobial stewardship in your workplace. As well as supporting patients to protect antibiotics for the future these activities will contribute to your Healthy Living Pharmacy portfolio. The Royal Pharmaceutical Society has also developed an Antimicrobial Resistance & Stewardship hub with supporting resources and a quick reference guide on supporting the best use of antibiotics in the community. Through CPPE you can also strengthen your knowledge of antibiotics by completing the antibacterials focal point distance learning or workshop.